The latest TCOYD (Taking Control of Your Diabetes) online newsletterfeatures my new diabetes survival guide – “Diabetes Do’s & How-To’s” – on its back cover. My thanks to all my generous friends at TCOYD and Dr. Steven Edelman, its founder. Read the whole newsletter and start learning. I interviewed Dr. Edelman as a diabetes change leader on The Huffington Post. He created a true breakthrough – the delivery of diabetes education directly to patients via conferences. Don’t hoard conferences just for doctors was his enlightened thinking. For while Edelman is a doctor he has also been living with type 1 diabetes since the age of fifteen. I also found my whole thinking about my power to live well with diabetes change when I attended my first TCOYD event. That was back in 2005 in San Diego. I was sitting in CDE/Psychologist, Bill Polonsky’s session. He said, “Diabetes doesn’t cause blindness, heart attack, amputation. Poorly controlled diabetes does.” Today he often says, well controlled diabetes is the cause of nothing. It made me realize my actions largely control my illness and I have power over my actions. Take good actions and you will benefit. I began using my power: eating healthier, eating less and walking more. The results have paid off and I see it each year when I get my blood work done. I highly recommend getting to TCOYD’s one day event, even if you have to travel. You will learn so much and it costs a mere $10 or $20 depending on when you register. Events are presented around the country, so see if there’s one coming up near you or take a trip, it’s worth it. This fall TCOYD will be in Worcester, MA, Omaha, NE, Albuquerque, NM and San Diego, CA. Here’s the schedule. For now, sending my best to all my friends at TCOYD, the thousands of patients who have benefitted from a TCOYD event, and those who yet will. 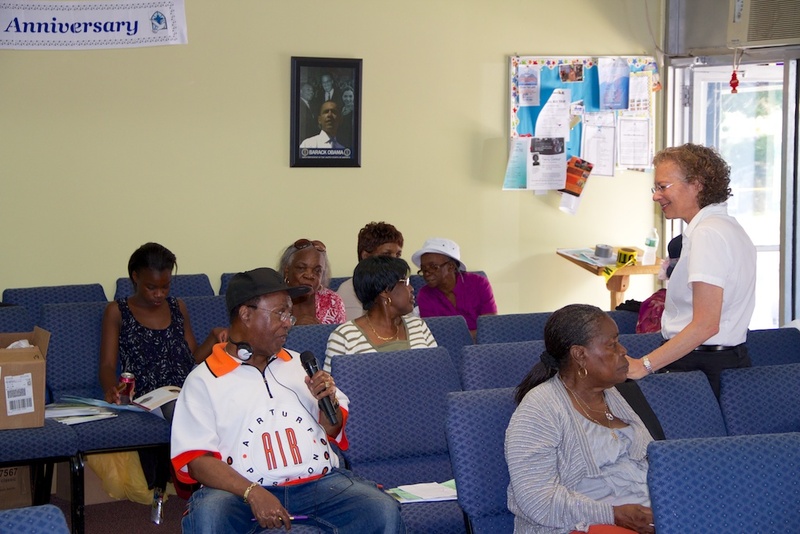 Saturday I gave the A1C Champion program in the Bronx. The Bronx is one of the five boroughs of New York City. The one also where diabetes has the highest concentration, largely because it is the poorest. I was speaking at a storefront church converted from an ordinary building. Bishop David was jamming as the afternoon’s DJ. There were about ten or twelve small folding tables in front of the church on the sidewalk where people could pick up some information about diabetes. A hot buffet table was set up where the hosts were ladling out a relatively healthy lunch – chicken, rice, beans, veggies, corn. Before my talk, I walked around the neighborhood. I wanted to see where you could shop for something to eat and what you would find. Certainly, I’m sure, there are supermarkets not far, but within the few blocks I walked, there were several “bodegas.” Little delis like this one above where you could run in and find food – sort of. This is what was on offer: sandwiches on big white bready rolls and packaged snack foods everywhere, it took up 95% of the store: candy bars, chips, bakery goods and sugary soda and juices. They covered the store from top to bottom. In one store, one lone bottom shelf held a few onions and potatoes. Those were the only fresh vegetables in the store, no fruit. In another store, I saw only rotting bananas as fresh foods go. 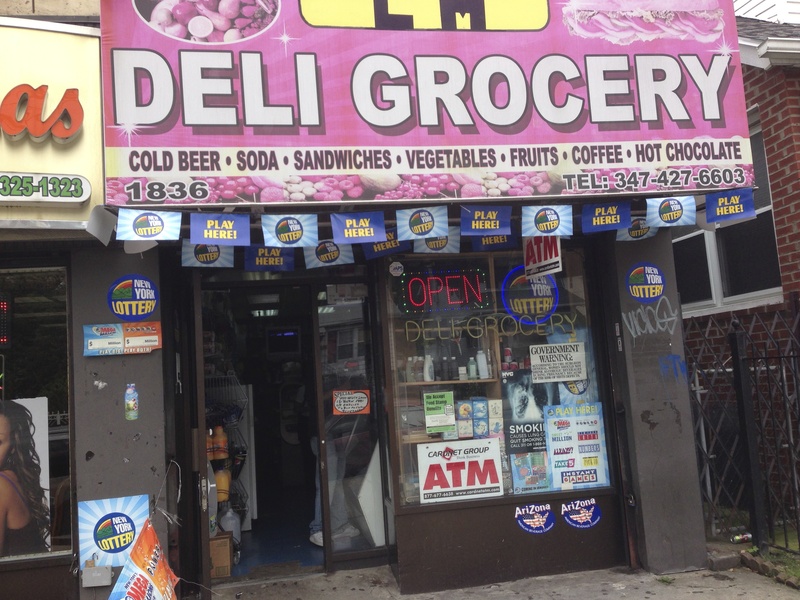 And this food desert – the Bronx – is only a subway ride from where I live. We keep saying people need to eat healthy; yet how are we helping them to do so? I also don’t have to tell you if it costs $1 to buy an apple and $1 to buy a Big Mac, where’s the incentive for people to spend their hard-earned cash on a piece of fruit? It saddened me to see what I read about in article after article. The food deserts in America. Those poor neighborhoods where there is no fresh food available and fast food brothels line the landscape – McDonalds, Burger King, Kentucky Fried Chicken, Taco Bell. Places that seduce us with sugary, fatty, salty foods and low prices. Obesity and diabetes are not merely about individual responsibility – they are also about infrastructure, what the government subsidizes, safe neighborhoods with places to play. It is about getting healthier foods into poorer neighborhoods and helping people do the right thing for their diabetes. Yet, it also gladdened me to find the 20 people I spoke to were engaged, curious, thirsty for information and many were eating better than their parents. They shared their strategies from a one day a month “cheat day,” to sautéing fish with plenty of lemon and herbs instead of frying, replacing half the juice in a glass with seltzer and sneaking ten minute walks into the day. The city councilman above gave a talk just before I went on and let people know how important it is to get exercise and about the parks he’s been building in the Bronx. His eyes were bright and clear as he greeted me and his passion for improving his community and helping people, was earnest. Saturday I traveled to a place so close to my home, yet so far from my world. But I also became a bridge for people to take a step from being under the thumb of this disease and its burdens to doing a little better. Riding home on the subway afterward, I was full from the adventure and my heart was light.